As the train zipped across London, my head was filled with anxious thoughts. I had to be home in time to bath my daughter. Was selling those stocks today really a good idea? Would I have time to get some exercise in this weekend. Would I meet my work targets for the month? I felt my temperature rising. But I knew exactly what to do. I pulled out a pad and pen and started to write down a list of exactly what needed doing. Within 10 minutes I had a feeling of ease and comfort once again. My mind settled and clarity returned. I was diagnosed with acute anxiety in my early 20s. I’m now in my early 40s, and know what it’s like to become overwhelmed. I can’t see the forest from the trees and my brain becomes overloaded. This leads to procrastination. I become fatigued and any creativity I may have is completely zapped from me. According to Daniel Levetin, author of the 2014 book The Organised Mind, most people can only hold about four things in their mind at a time. Valuable neuro resources can be wasted when there is lack of awareness as to the most important things that need to be done. Making a list provides clarity and allows us to prioritise. This in turn leads to greater immersion in the most important task of the moment. When we pay close attention to the activity at hand, we enjoy it more, and do a better job. I have now progressed to having a master list with all my to-be-done tasks and also a daily list. I tend to only have three tasks on my daily list at one time. According to Chris Bailey, author of The Productivity Project, having three items to focus on throughout the day helps you to stay centred and accomplish more. Even on days when everything is up in the air. This has turned me into a productivity Jedi – and even improved my sleep. I realise that I actually don’t have a million things to do. Making a list cuts an out-of-control thought stream dead in its tracks. By getting stuff on paper, I can assess what needs to be done. It is then and only then that I realise everything I need to do is more than achievable. Ticking completed jobs off is satisfying! I feel in-control and productive knowing I’m making progress once again.My situation is improving and that feels good. Procrastination and worry use up vital energy. If I know exactly what I have to do, I tend to get things done more quickly. Certain jobs carry greater urgency than others. If those can be tackled first my load becomes lighter and I have more time in my day. 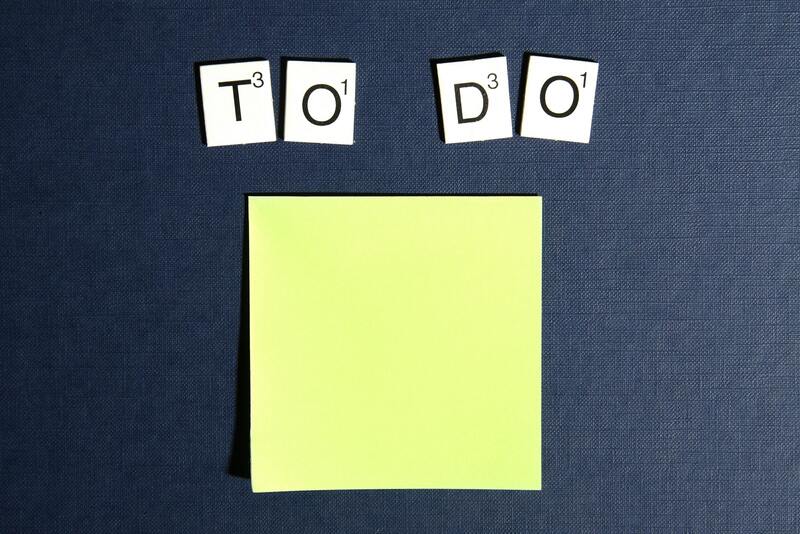 To-do lists help me sleep – yes, really! I need to recharge my batteries so I can go again the next day. If I have anxious, overwhelming thoughts clattering around in my head, it doesn’t set me up for a good night’s sleep. If I know everything is in hand, then I drift off peacefully. Life flows when the mind is organised. I challenge you to try working with a to-do list for one month. Create a master list that you can refer to throughout the week, and daily lists with no more than three items. You can write your daily lists each morning or at the end of your work day for the next day. Notice how it feels to check things off. You’re in control, you’re making progress, and suddenly more feels possible, doesn’t it? It’s just a piece of paper, but it can change your life.